I am not a feminist, but I am amazed at the number of studies that have found women better than men in various skills. Here is a list of 10 skills where women seem to be doing better than men. Women drive better than men. Well this reverses a social myth – that women are bad drivers. Carnegie Mellon University researchers found after analyzing a lot of traffic data in 2007 that men are 77% more likely to die in a car accident than women, keeping the miles driven constant. So next time when your husband asks you to hand over the car keys, just give him this article. Women remember appearances better than men. Some would say, “Why not? Don’t women pay all their attention to appearances?” Well, say what you may, but only a loser complains about somebody for being better than him! Terrence Horgan, research fellow in psychology at Ohio State University, and her co-researchers found in a study that women are more accurate in describing appearances after seeing people once. The study was published in the journal Personality and Social Psychology Bulletin. Women cooperate better than men. We can see this everywhere, but still if you want a citation, here it is. A study by Rolf Kuemmerli and other researchers at Edinburgh and Lausanne universities indicated that women cooperate better than men. In the research, based on games played by 100 Swiss students, women cooperated with others almost twice as much as men did. Women eat better than men. This is probably not so obvious, for rarely do we notice gender differences in eating habits. A survey involving 14000 Americans, conducted by University of Minnesota, revealed that men are more likely to eat frozen pizza and meat, whereas women are more likely to eat fruits and vegetables. Women perform better than men in timed tests. So if time is precious, women are better at preserving it than men. A study by Vanderbilt University researchers in 2006 found that women score better in timed intelligence tests than men. The study, published in the May-June issue of the journal Intelligence, didn’t find much difference in un-timed tests, which meant women had a quicker mind. Women perceive their relationships better than men. Talk about relationships and most men will frown. Now you know why – they know so little about their relationships! A Hebrew University of Jerusalem study, after surveying 97 couples in the United States, found that women are more perceptive than men in describing their relationships. The study, published in ScienceDaily, reported that women were much more accurate in describing the perception of their partners than men. Women communicate better than men. This is now scientifically proven and acknowledged. Louann Brizendine, neuro-pyschiatrist at the University of California at San Francisco, found in a study that women can process 20000 words a day compared to men’s 7000 words (Louann Brizendine,The Female Brain, Morgan Road Books). This difference, as per Brizendine’s study, is more biological than social, which starts as early as the fetal stage. Women learn better than men. That is why girls get better grades in school on an average than boys in many parts of the world. Dr Simone Kruger of Edge Hill University, UK, found in her research based on remote learners that women learners were more successful in sharing ideas and experiences with each other, and hence learnt more efficiently than men. Women invest better than men. You don’t believe it, do you? We all know fewer women invest in stocks than men do, but the few women who invest in shares do better than their male counterparts. 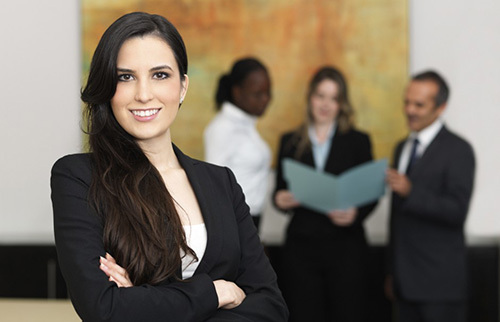 A study by the National Association of Investors Corporation (NAIC) for the University of California found that women earn on an average 1.4% more than men in their share portfolios. Women cope with stress better than men. A study at the University of California, Los Angeles, published in the July 2000 issue of Psychological Review, found some biological and behavioral differences in the ways men and women cope with stress. It found that women tend to seek contact with others and social support when they are under stress, which is a psychologically much better way of coping with stress than the “fight-or-flight” approach of men. Of course, there are other studies which indicate men are better than women in various skills. The point I want to make is not that women are better than men in everything, but that men should stop underestimating women after being proven wrong time and again. Paul Felix Lazarsfeld, an Austrian sociologist, influential methodologists, and one of the pioneers in mass communications, is recognized for his scientific investigations on the effects of media in the society and for employing surveys and experiments to gather empirical observations and generalizations. In 1925, Lazarfeld obtained his doctorate’s degree in philosophy major in applied mathematics at the University of Vienna, where he founded a research institute for applied social psychology four years later. In 1933, he went to the United States and served as the Director of the Office of Radio Research at the Princeton University after receiving a research grant in psychology from the Rockefeller Foundation. In 1940, his project was transferred at the Columbia University where his office was renamed the Bureau of Applied Social Research. With Hadly Cantril and Frank Stanton, Lazarsfeld is remembered for his detailed investigation of the radio habits of the American listening public. This investigation led to the famous radio broadcast of “War of the Worlds” in 1938. Orson Welles borrowed freely from H. G. Welles’s novel and created a radio drama that resemble to news stories. One out of six listeners believed that aliens had invaded the universe and eventually panicked. The invasion from Mars panic was seen by elite observers as a definitive proof of mass society theory, that is, if a radio program could induce such wide-spread panic, obvious and concerted propaganda messages could do much worse. Lazarsfeld affirmed that many listeners acted hastily and that simulated news stories were trusted without question, especially the eyewitness reports and the interviews with phony experts. He also concluded that media audiences have one or more psychological traits that made them especially susceptible to media influence: fatalism, phobic personality, emotional insecurity, and lack of self-confidence. At the Princeton University, Stanton, Cantril, and Lazarsfeld were part of a vanguard of social scientists who slowly formulated new views of how media influence society. They argued that media were no longer feared as instruments of political oppression and manipulation because the public itself was viewed as very resistant to persuasion and extremist manipulation. They believe that most people were influenced by others rather than by media; opinion leaders in every community, who, at every level of society, were responsible for guiding and stabilizing politics. Media were conceptualized as relatively powerless in shaping public opinion in the face of more potent intervening variables like people’s individual differences and group memberships. 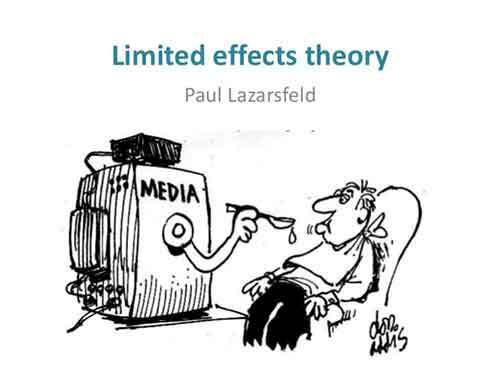 Lazarsfeld pioneered the use of surveys and experiments to measure media influence, which, in turn, provided evidence that media rarely and indirectly influence individuals. He assumed that media effects were quite limited because in the more micro, or in the individual level, only a limited number of listeners were directly affected. It should be noted, however, that Lazarsfeld and his colleagues, like Carl Hovland, were not theorists; they were methodologists. Unlike mass society theorists who assumed that media were quite powerful, they employed empirical social research methods like surveys and experiments to gather empirical observations and generalizations. They argued that media influence can be measured, observed, understood, controlled, and utilized for the benefit of the human race. They also argued that if the physical sciences permit people to control the physical world, the social sciences can also permit people to control the social world. Lazarsfeld and his colleagues, while conducting their full-scale investigation of the effects of political mass communications in Eríe County, Ohio and in Elmira, New York during the 1940 and the 1948 presidential elections, respectively, found out that media were not as powerful as mass society theory assumed and that media influence over public opinion or attitudes was hard to locate. They also found out that people had numerous ways of resisting media influence and were influenced by many competing factors and that media influences were typically less important than social status, group membership, educational attainment, religious or political party affiliations, among others. These findings eventually led to the formulation or construction of the limited effects theory, also known as the indirect effects theory. A paradigm, also called framework, provides a useful guide in research as long as its basic assumptions are accepted. Though a paradigm exercises great influence over the course of a research, a shift inevitably occur because no paradigm can provide adequate explanations for all observations. Also called theoretical innovation, a paradigm shift occurs when there are efforts to account theoretical limitations and when a new theory is formulated or constructed over and above a dominant theory. It is at this context that the limited effects theory is considered the paradigm shift of the mass society theory. Formulated from “disciplined” data collections and data interpretations, the limited effects theory was gradually constructed using the inductive approach to theory construction. It assumed that media lacked or have limited power to instantly convert average people from strongly held beliefs, and that it negates, if not totally contradict, the mass society theory assumption that media have the power to reach out and directly influence the minds of the average people. The limited effects theory gained popularity because it provided answers to the questions of troubled elites in the 1930s. When the propaganda theory threatened to challenge freedom and democracy, the limited effects theory argued that most people could not be directly influenced by typical propaganda messages. However, the limited effects theory actually placed little faith in the rationality of the individual or in his ability to evaluate propaganda messages. During the 1950s and the 1960s, studies found out that most people are politically ignorant or apathetic and that only some people are politically active or involve because their collective wisdom and political knowledge were concentrated in the opinion leaders who are the mainstay of any political system and who play an important role in shaping or reconstructing the voting systems of the electorate. The refinement and broad acceptance of empirical social research methods was an essential factor in the development of the limited effects theory. This was so, because empirical social research methods were promoted effectively as the only “scientific” way of dealing and measuring social phenomena. People who advocated mass society theories were branded by empirical social researchers as “unscientific.” Mass society theorists were considered as doomsayers, political ideologues, biased against media, or fuzzy-mined humanists. Social researchers exploited the commercial potential of empirical social research method and gained the support of private industries. The development of empirical social research method was strongly backed by various private and government foundations like the Rockefeller Foundation and the National Science Foundation. After empirical social research methods showed that media were not as powerful and threatening as assumed by mass society theories, media companies were encouraged to finance more empirical social researches. Empirical social researchers were successful in introducing their approaches within the various social research disciplines – history, sociology, economics, political science, and social psychology – that shaped the development of communication research. Empirical social research was widely accepted as the most scientific way to study communication even though it proved difficult to find conclusive evidence of media influence. Media rarely have any direct influence upon individuals. Most people are sheltered from direct manipulation and that they do not believe everything they read, hear, or watch. This assumption negates, if not totally contradicts the assumption of mass society theory that people are isolated and vulnerable from direction manipulation. There is a two-step flow of media influence. Media could not influence people if the opinion leaders who guide them are not influenced by its messages. By the time most people become adults they have developed strong group commitments like political party or religious affiliations that media messages are powerless to overcome. These commitments make people to reject media messages although other group members are not present to help them. When media effects occur, they are modest and isolated. Large number of people will not change their votes although they are flooded with various media messages everyday. Surveys can not measure how people actually use media on a day-to-day basis because they can only record how people report their media experiences. Surveys are very expensive and cumbersome way to study people’s use of specific media content like their reading of certain news stories or their viewing of specific television programs. The research design and data analysis procedures are inherently conservative in assessing the power of media. Although surveys can be useful for studying changes over time, they are a relatively crude technique. Surveys omit many potentially important variables by focusing only on what can be easily or reliably measured using existing techniques.